I know stainless steel scrubs are usually for cleaning tough spots out of stainless steel woks and pans. I use a regular kitchen sponge for my bowls and plates. However, sometimes the dishes get crusty, and a stainless steel scrub works best for getting those off. My question: will this in any way damage the bowls and plates? These are regular, microwave-safe, dishwasher-safe porcelain dishes. Will the scrub scratch the surface, making it harmful to ingest from those dishes? You can but you probably shouldn't. 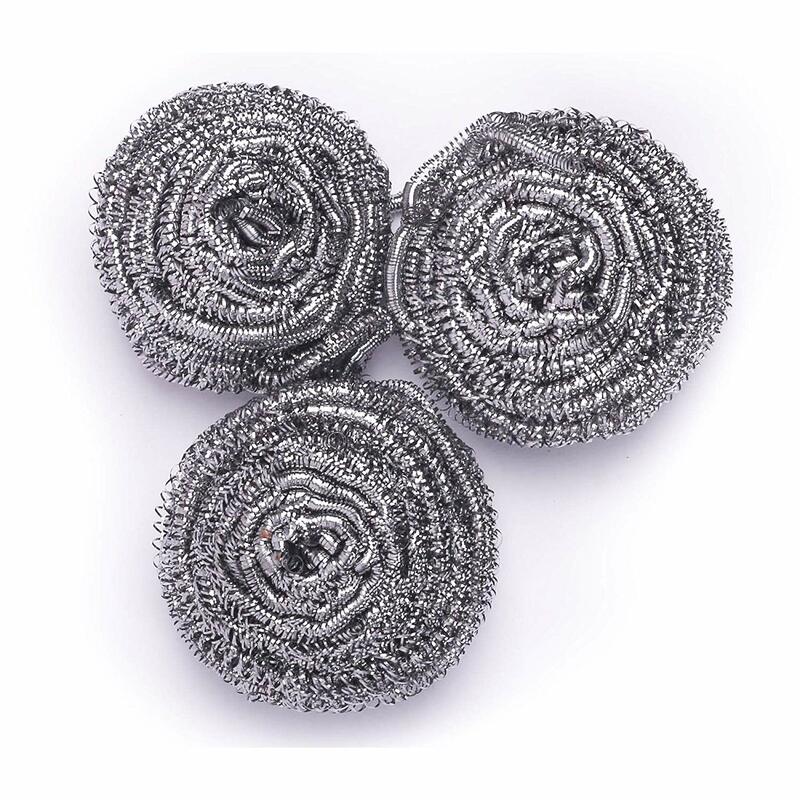 Stainless steel scrubs are quite coarse, rough and with sharp edges. They are particularly abrasive, suited for scrubbing the pan's metal surface and removing the outer oxidized or grimy layers and achieve a "shiny finish". Used on ceramics I imagine they will scratch the glossy surface quite easily; with continued use it will eventually lead a faded finish and loss of gloss. It will largely depend on the hardness of the specific ceramic type. I would assume average quality ceramic dishes, but even for a finer quality porcelain over a longer term it will probably eventually wear out the vitreous coating, and on extreme cases even reach the more crumbly inner substrate. On a more expensive/high quality porcelain service I imagine you would want to use something softer anyway, to prevent premature wear, particularly if it is some sort of antique, heirloom, has any sentimental or monetary value. Decorated items with paint or enamels will be particularly sensitive to abrasion, since even continued use in a dish washer will lead to faded colors over time, especially on over-glaze decorations. Sure, knock yourself out. Should work fine. Most household steel is between 5 and 6.5 on the MOHS scale of hardness. Ceramic glazes for high-fire ware are from 7 to 8, about the same hardness as glass. This means that the steel cannot scratch your plates. This assumes that you are using plain high-fire (porcelain or hard stoneware) plates. If your plates have enamel designs, gold edging, or other decorations that aren't part of the ceramic, those could be softer than steel and thus likely to get scrubbed off. It's also possible that some of your dishes aren't high-fire ceramic, and thus could be scratchable. Test on the underside of anything you're not sure about. Not the answer you're looking for? Browse other questions tagged kitchen-safety stainless-steel kitchen or ask your own question. Baking bread - stainless steel or potless?